The Aztecs might be all but gone, but that doesn't mean you have to abandon their style and jewelry. Keep your eyes peeled for some beautiful ancient Mexican fashions and dive headfirst into the Aztec gold style! Fingernails are the perfect natural accessory to any look. Don't forget that a simple, small layer of fingernail polish can make all the difference in the world when it comes to completing that signature style. 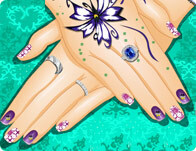 Design your very own dream nails with custom colors, patterns, stamps and decals, then finish off your new look with an assortment of matching mood rings, diamond rings, tattoos or heart shaped gold pendants. Get creative and take finger fashion to the next level! 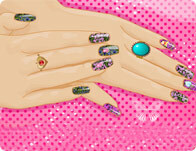 Nail, Put some polish on those nails and design some nail art. The finger beauty doesn't have to end at your nails. Accessorize with rings, bracelets, and stickers! You'll always find the cool games at Girl Games, we have all the best games from game developers like i-dressup, girlsgogames and cartoon doll emporium so you will never get bored! 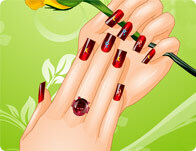 This month we have some amazing games like Glitter Pedicure , Cinderella's Cocoa Nails and Broken Nails Crisis. New games are added every Thursday, so check back for all the latest free games online!